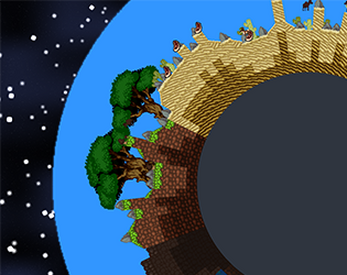 2D planet, where players goal is to maintain ecosystem, care for alien animals and gain enough funds from space safari to continue his quest. Human expansion left many ecosystems destroyed. You are selected as a new zookeeper with quest to use one of tiny, inhabited planets as a shelter for endangered species. Will you succeed in creating the ark? Hover over an animal to view it's HP and hunger level. Visitors are paying you more money when your animals are not hungry. If there's no food, omnivores and carnivores will attack other animals. Animals will sometimes start spinning in one place. Throw them some food and they'll feel better. Game's completely not finished and absolutely not in state that I would like. If everything goes well, and the concept will get accepted by the community I'll gladly continue working on this project. Feel free to give me you opinions and what's subject to change. I've included a simple command prompt that you can access with the " ` " button.